I wish this title applied to one (or both) of my kids, but the official title truly goes to Elijah. This photo conveys only a fraction of his oversupply of joy. He's got sweet "hockey tattoos" too. 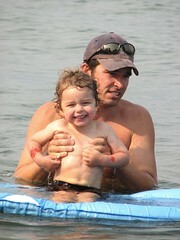 A couple more photos of him and his pa: floating out with the big boats and providing pure-stoke propulsion for the floatie.